Anton Paar’s autosampler for the PSA series is the only sampler on the market that can be used for both wet and dry dispersions, and is able to automate the sample measurement process. Available for the PSA 990, PSA 1090, and PSA 1190 models, the autosampler picks up and pours samples automatically into the particle size analyzer, enabling you to focus on other tasks. 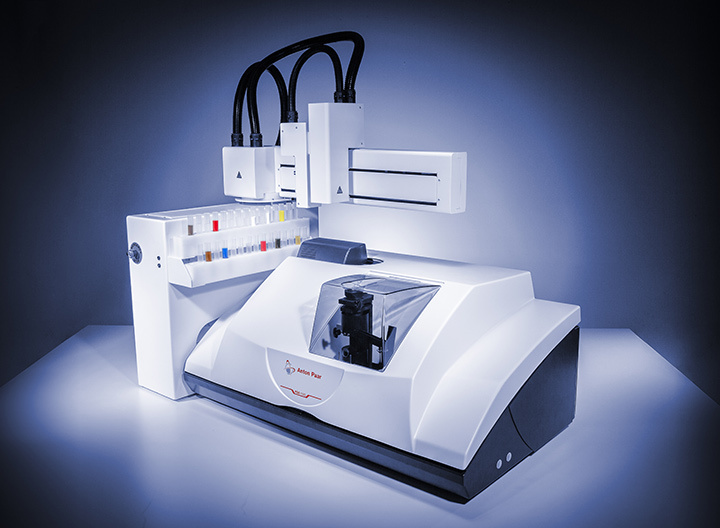 The autosampler is equally suitable for industrial as well as lab applications. The autosampler can be filled with both wet and dry samples. The software lets you define whether the sample is to be measured in liquid or dry mode. Up to 30 samples can be processed in one high-rate measurement cycle. Such a procedure saves time and eliminates the risk of manipulation through the operator and thus avoids errors. The autosampler is operated via the PSA software. Everything is integrated; you don’t need additional software to control and run the autosampler. The operation is very intuitive and user-friendly – a measurement cycle is set up within a few minutes and can be repeated with just one mouse-click.